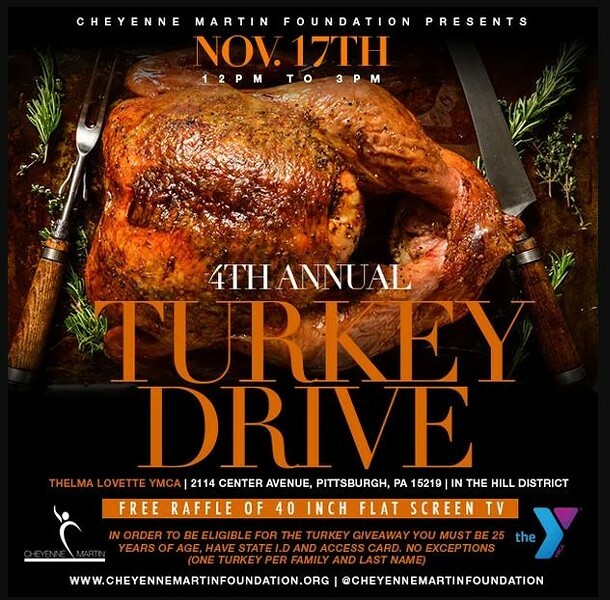 The Cheyenne Martin Foundation Presents its 3rd Annual Turkey Drive!! On November 17th from 12pm-3pm CMF will give out free turkeys at the Thelma Lovette YMCA at 2114 Centre Avenue, Pittsburgh, PA 15219. To be eligible for a turkey, participants must be 25 of age and present a state-issued identification and access card. One turkey per family and last name. No exceptions, please. During the event, the foundation will hold a free raffle for a 40-inch smart, flat screen television.